The horn cannot be too heavy for the head of the cow that will carry it. After bouts of politics and outright deceit, a Second Bridge across the River Niger in the Anambra /Delta axis is underway. Power, Works and Housing minister, Babatunde Raji Fashola, a man of few words, has boldly stepped out to show that he is indeed an action minister. Curiously, this is happening under President Muhammadu Buhari. Let the truth be told. The need for a second Niger Bridge became obvious during the Second Republic of President Shehu Shagari. As far back as 1981, a trip across the Niger from Asaba during yuletide was nightmarish. It was a tortuous line of frustrated commuters and holiday makers. Many who departed Lagos in the morning did not get to their destination until late at night. Some only made it after 24 hours. And that bridge links several geo political zones in the country: The South-East, South –South, South -West and up to the North- Central. Fashola has that magic wand that brings change. We all know what he did with Oshodi, a place that was once the equivalent of No man’s land, in Lagos. Oshodi was like a republic unto itself until Fashola moved in with bulldozers. Expect the same across the Niger. The former Lagos State governor has promised to do the needful , banking on increased budgetary allocation of 394 billion naira in 2018, a far departure from the 18.132 billion the Works ministry got in 2015. While those of us from the South-East and South-South zones blame the federal government for playing hide and seek with a second bridge across the Niger, we must hold some of our own responsible for toying with the project. The greatest disappointment came during the Dr. Goodluck Jonathan Presidency. In March 2014, the president performed the ground breaking ceremony. That was 50 years after the first bridge was constructed. President Jonathan promised the world that he was going to complete the project. 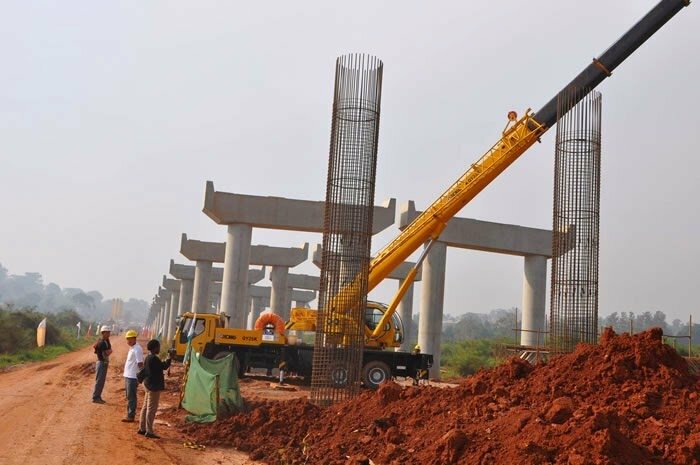 His political speech that the first Niger Bridge was constructed during the tenure of President Nnamdi Azikiwe and the second bridge would be completed by another Azikiwe[Jonathan] was meant to earn him votes from the South-East. The job was tagged a Private Public Partnership and cost put at 117.9 billion naira. That declaration was made in the presence three governors: Peter Obi [Anambra], Emmanuel Uduaghan[Delta] and Theodore Orji [Abia]. Also present were Deputy Senate President, Ike Ekweremadu, Deputy Speaker, House of Representatives, Emeka Ihedioha and Finance minister and Coordinating minister of the Economy, Ngozi Okonjo-Iweala. A paltry sum of 40 million was set aside for construction to begin. The bridge was to start from Ogbaru in Anambra, to Delta State. However, there was no concrete plan to compensate land owners unlike what obtained before work commenced on Eko Bridge, Lagos on December 1, 1965. Before Julius Berger Aktiengesellschaft moved to site in Lagos,” landed properties were acquired, buildings demolished, and dislodged tenants found alternative accommodation in Surulere”. Jonathan got the votes he needed from the South-East and the South- South in 2015. Between 2014 when he made the political statement and 2015 when he lost to Buhari, it was all politics and no action. Before Jonathan, some powerful Works ministers from the two geopolitical regions did little to realize this dream of a Second Niger Bridge. While kith and kin spent endless hours on the bridge, the ministers and their immediate families took the alternative flight across. In the Shagari years, there was the much respected Victor Masi, from Omoku in Rivers State. He was a tough Biafran Army officer and knew when the first bridge was blown up by his retreating comrades in arms. Under President Olusegun Obasanjo, we had Chief Tony Anenih. His wife, Josephine, from Anambra also became a minister. I wonder how the family felt anytime they plied the Asaba-Onitsha route. There was Mrs Diezani Alison –Madueke who got our sympathy when she wept during an inspection tour of the Benin-Shagamu Highway. Her brief stay in that ministry did not help. Chief Chris Ogiemnwoyi was minister of State for Works. He also had an Ogbaru wife, Stella Oduah, who rose to head the Aviation ministry. Today she is in the National Assembly as a distinguished senator. Mike Onolomemen came on smoking. An Ishan chief like Anenih, he is at home with the River Niger which passes through Ilushin in his area. The Second Niger Bridge could not come under him. It became a big embarrassment that fellow Nigerians continued to suffer even when those who should have done something chose to play to the gallery. At a stage, there were fears that the bridge would collapse. Construction work on the first Niger Bridge commenced in 1964. Dumez, a French company got the 6.75 million pounds contract. It was designed by Netherlands Engineering Consultants of the Hague Holland[NEDECO]. Prime Minister Abubakar Tafawa Balewa, commissioned it in December 1965. Today, Fashola is working hard for President Buhari to commission the Second Niger Bridge. Soon and very soon, we are going to see the bridge. Let someone shout alleluia. Mr. Minister is also working on Power and Housing. Generation has increased from 4000 MW to 7000MW, transmission from 5000 MW to 7000 MW and distribution from 2,690 MW to 5,222 MW. Fashola assures that the Zik Mausoleum in Onitsha has now been practically completed. Chief Umenzekwe is Onwa of Achina, Anambra State. Previous Jubril or Buhari in Aso Rock? Investigate!